Season 1, Round 3 of the Arcadia 2001/MPT-03 High Score Club will last about two weeks (although, as I post this here on AtariAge, there is only about one week left). This round ends on Sunday, November 5, 2017 at 10pm MST (aka Monday, 2am GMT). 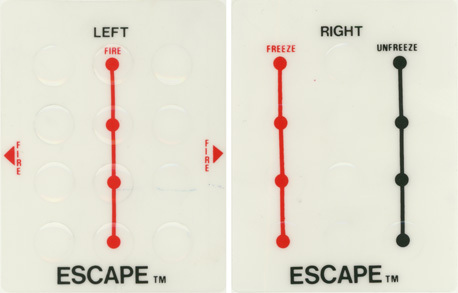 The game being played this round is Emerson's cartridge #3, Escape, a game that is similar to Berzerk. Play Escape for high score on real hardware (PAL, NTSC, and any Arcadia family systems) or use the WinArcadia or MAME emulator. Play Game 2, Option 2. For more on options settings see that section below. Post pictures of your high scores here. Use the left-hand controller to play the game. The fire button, or any button on the gamepad, shoots your weapon. You can "freeze" (pause) the game by pressing the left-hand column of keys. You can "un-freeze" the game by pressing the right-hand column. I'm using Ward Shrake's "Director's Cut" of his Arcadia 2001 section of the Digital Press Collector's Guide 7 (published in August 2002) for most of the information that is in this section. Escape by Emerson. Confirmed. 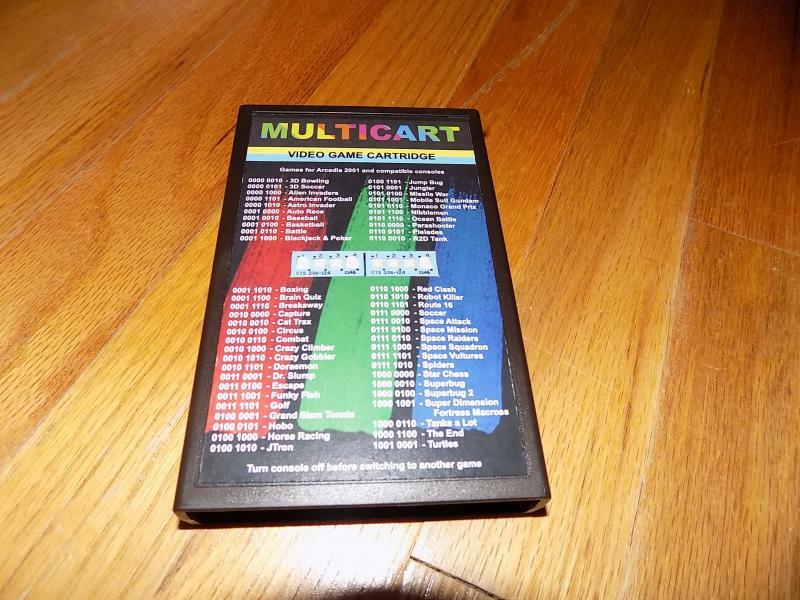 4k cart. 1982. #1015 (3). One player; left side controller. Game by "UA Limited". Long case. 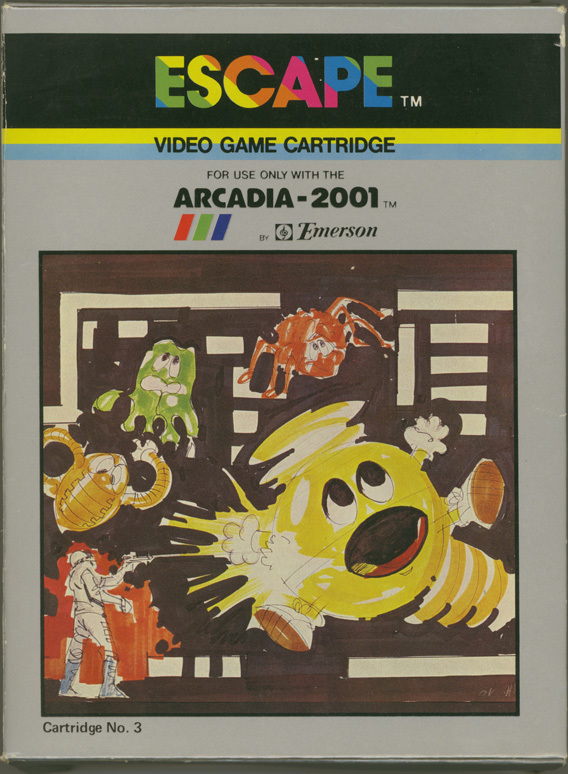 A common Arcadia game that is best described as a "legalized" version of the game "Robot Killer" (not released for the Arcadia family in the United States), which is a much more blatant copy of the arcade game "Berzerk". 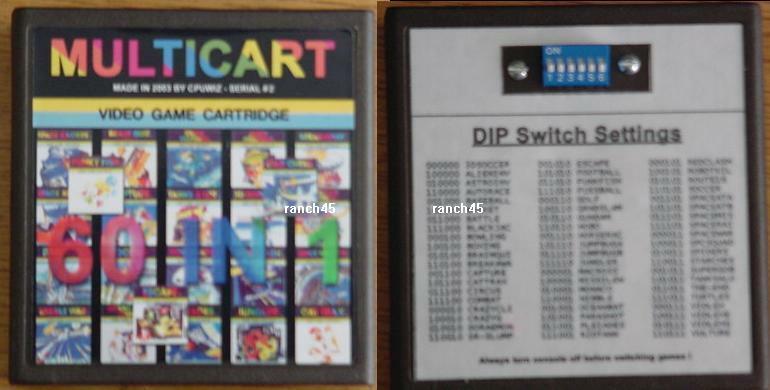 Comparing ROM images has shown they are based on the same code with just a few changes. The main ones are that they changed the way Evil Otto acts, so that portion of the game isn't a blatant copy. Other than that, it appears like they changed the shape and/or color of the robot's graphics. There are 4 different games plus 4 options which make a total of 16 possible play combinations. The purpose of the game is to score as many points as possible. Points are achieved when the MAN destroys the Electrified ALIENS by shooting in one of eight directions. If the MAN destroys all ALIENS in one maze then it results a 200 points extra bonus. Whenever the MAN escapes from the maze you get 100 points. Although the MAN has 4 lives, he may be killed as the Electrified ALIENS shoot at him. He can also be destroyed upon collision with Electrified ALIENS or the electrified walls of the maze or by the SPINNER which attacks the MAN from time to time after game play has progressed. A SPINNER will appear after game is started and will spin for 30 seconds aiming for the MAN. The SPINNER is capable of penetrating the electrified walls and is immune to all bullets. The SPINNER therefore is indestructible. After attacking, the SPINNER will spin again for a shorter period before a second attack. Within the spinning period, the SPINNER is absolutely harmless. The firing frequency interval will be shortened after each unsuccessful attack. However the tracking accuracy of SPINNER increases with each shot. After 7th shot it will surely track you down. When the MAN escapes from the maze, the next maze will appear. Eight room mazes are provided and will be called up randomly. Game 1 - The ALIENS will not shoot at the MAN. Game 2 - The ALIENS can shoot only 1 bullet at the moment anytime. Game 3 - The ALIENS can shoot two bullets at a time. Game 4 - The ALIENS can shoot three bullets at a time. Option 1 - Eight ALIENS all capable of motion. Option 2 - Twelve ALIENS all capable of motion. Option 3 - Sixteen ALIENS all capable of motion. Option 4 - Twenty ALIENS all capable of motion. This is a one player game. Use the left controller only. Press any number on Keyboard to start the action Press Disc (or move Joystick) to direct the "MAN" where to go. i.e., press Disc/Joystick on left (9 o'clock) to move to left, 3 o'clock to move to right, 6 o'clock to move down and 12 o'clock to move up or move to 45° etc. To shoot, squeeze either Action Switch at the side of hand controller or press any number on keyboard. The shooting direction is controlled by the Disc/Joystick. 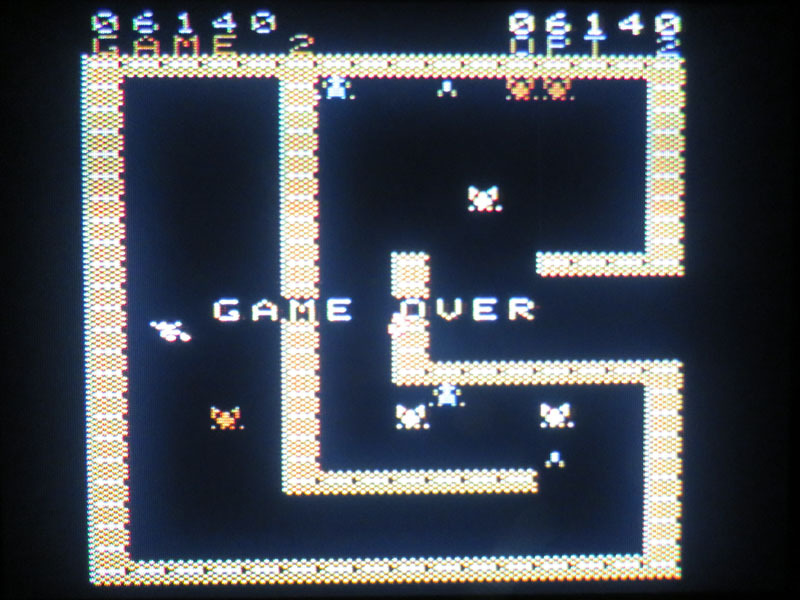 Continue to play until screen reads "Game over". To maintain highest score on the screen, merely press "Start" button for the next game. Do not depress "reset" otherwise all scores will be wiped out. This game is too easy on the default settings. Play Game 2, Option 2. Game 2 allows the aliens to shoot one bullet at the time (default setting is zero). Option 2 has twelve aliens on the screen. For more on options settings see "The Various Games" section (above). If the game seems too easy (or, more unlikely, too hard) then we may adjust the gameplay options for this game. Escape - Video Review - (1 Point) - I found a few video reviews of this game (maybe because it's common? ), but it's always nice to see other people's opinions. Anyone who makes a video review of Escape will get a bonus point. Escape - Documenting Bugs - (1 Point) - Arcadia games can be flaky. If anyone find any problems, and documents them, then you'll earn one bonus point. We found quite a few bugs for Space Attack in the last round; let's see if we can do the same for this game. Just in case there are dozens of bugs, you can only earn one bonus point no matter how matter bugs are found. Escape - Backstory - (1 Point) - I can't believe that Escape doesn't have any backstory at all. Well, that's not entirely true. 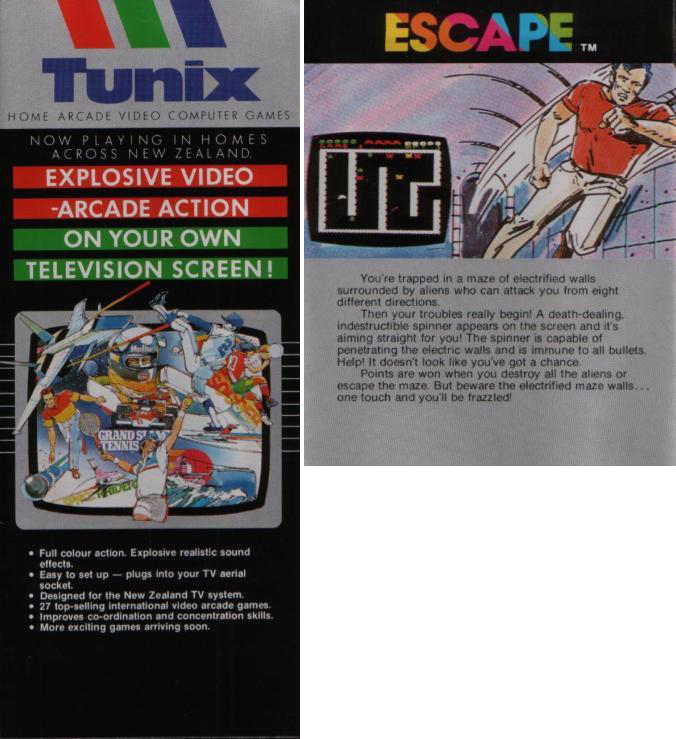 The Tunix version of Escape has a brief backstory, at least in the game catalog. Anyone who writes a storyline for this Escape will get a bonus point. It would be simple to base this game's backstory on Berzerk, but that would be cheating; come up with something original. How about no robots? While testing Escape for this round, my memory served me well. This game plays painfully slow. Maybe it's possible to get used to it? I guess we'll find out. I contacted Albert about creating an AtariAge sub-forum for the Arcadia family, but I still haven't heard back from him.. In the last round I said that I would just post the HSC in the general forum. I never did that for rounds 1 or 2... so I'm finally doing it now. As always, as you play Escape, please post pictures of your scores as the round progresses. Not only does this help you not forget to play the game, but it gives other player's a challenge to try to beat your score. If you've not played in a round before now, then now's the time to join in! Have a fun third round, everyone! Well... it looks like you're going to have to unpack it. How else are you going to play the Arcadia 2001-- the most incredible video game console every released... by Emerson Radio Corp. The Arcadia is so tiny that you can set it up anywhere. Put away those other systems, for (as you'll soon discover), the Arcadia family of consoles is all that you'll ever need. There's a game to fill every genre, as long as you pretty-much only want to play shooters and maze games. Yeah, if that's so, then you're set for life with the incredible Arcadia. 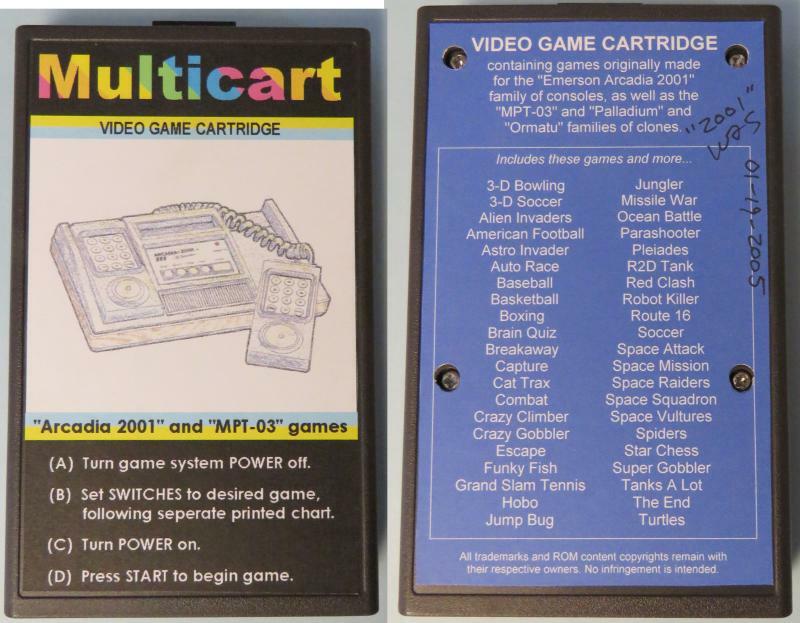 Who here has one of the multicarts for the Arcadia so that they can play the many non-U.S. released games? Come on Jeff, get that arcadia back out right this minute!!! Damn, you Arcadia people are pushy! Wish I had seen this when it started. Next season I guess. If anyone interested, then I can start a two-week catch-up round. Sound good? We're not pushy, we just know that the Emerson Arcadia 2001 is the best 8-bit game console ever released... that used the Signetics 2650 CPU. Young man, you will get no dessert untIL you finish ALL your arcadia! Is that fair to the other participants? We don't care, just try and beat us!! I will if Jeff does. It's all on you now Jeff!! A catch-up round is only unfair if you beat my score. Nah, actually, there are nearly always catch-up rounds in high score clubs. These are so that people can join the HSC pretty-much anytime and still feel that they have a chance in the competition. These catch-up rounds usually take place around the middle of the season, but it would make sense to have a catch-up round now because the Arcadia HSC has only just now been announced on the AtariAge forums. 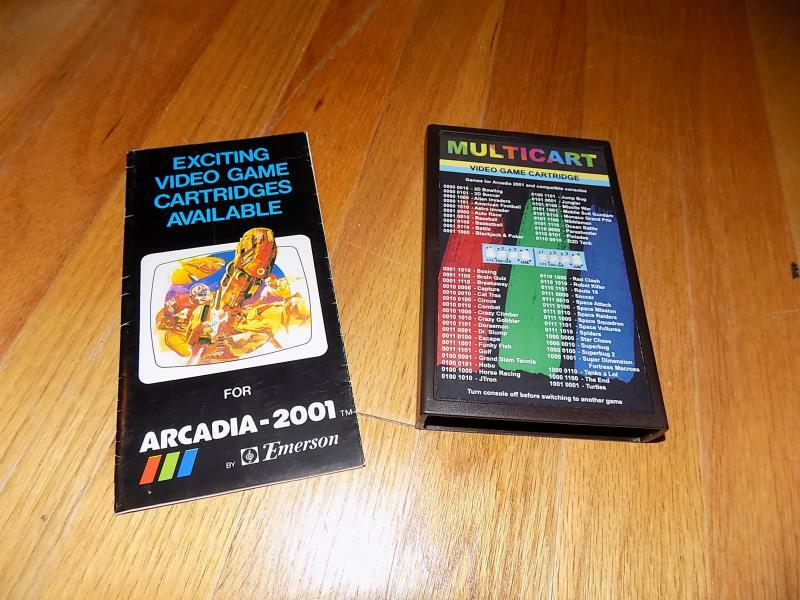 We're playing Arcadia games in the Emerson cartridge release order. The first game was Cat Trax (a maze game) and the second game was Space Attack (a Galaxian-style game). I'll try to announce a catch-up round in the next few days here on AtariAge. But it's just empty calories anyway! I always have an NTSC CRT hooked up in my office so that I can hook-up any system I want up to it quickly. My 14" CRT (which I use more than my 19" and far more than my 27" CRT) usually either has my Arcadia, Astrocade or Atari 130XE hooked up to it via either RF, composite or s-video. Rarely, I hooks up my Wii or PS2 to the same TV via component cables. I couldn't ask for a more flexible CRT TV. Someday I may have to buy an upscaler, but for now, using old analog TVs works better (and is far cheaper). I do [have an Arcadia multicart]! Hey, I've not seen that one before! Who makes (or made) that one? 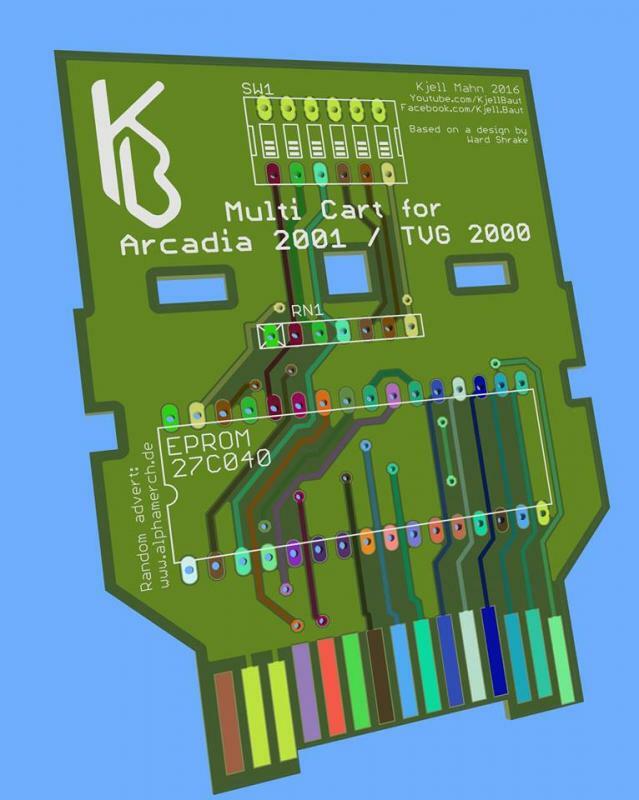 If you don't have an Arcadia multicart, then don't despair. The Arcadia emulator in MAME works pretty good, and WinArcadia works even better. I posted this score to the Arcadia Yahoo group, but I figure that I'd double-post it here so that Atari Age users can get inspired to play Escape on their Arcadia family system too. Remember to play Escape on Game 2, Option 2, otherwise the game is much easier. I was quite surprised when I found myself having fun playing this game. Escape isn't fast-paced-- it's almost calming-- but in this calmness, where your character slinks around the screen, maybe tip-toeing his way through the hallways, is a hidden depth. 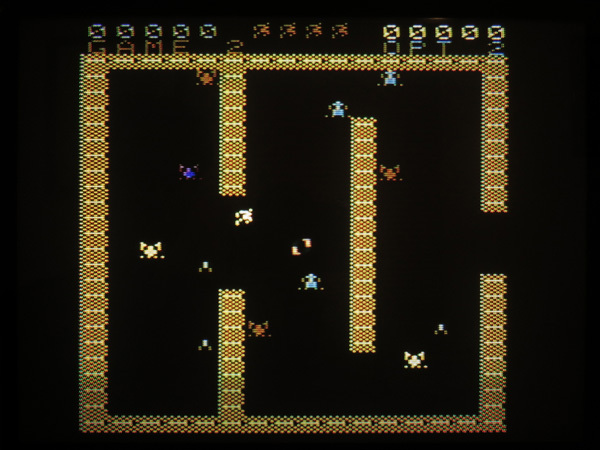 This game is pretty fun, but you really have to not think of it as a Berzerk clone. It has all the earmarks of being a rip-off of that Berzerk. Let's face it; Escape started like as Robot Killer (which was released outside of the U.S.), which is clearly an unauthorized clone of Berzerk. However, in UA Limited's attempt to make this game legal in the United States release, they changed it enough to make it a game of its own. They changed the graphics slightly-- from robots to, I don't know, things (called "aliens" in the game). But it was the replacement of Evil Otto with a Spinner in the middle of the screen that changed this Escape enough to make it its own game. Does the Spinner really change the game that much? Play the game for yourself and see for yourself. I can't believe I'm saying this... but I think that I like Escape! I will try t o get a score in soon! Season 1, Round 3 of the Arcadia 2001/MPT-03 High Score Club ended on Sunday, November 5, 2017 at 10pm MST. Four people played Escape in this round. Everyone posted their scores on the Yahoo group forum; no one posted any Escape scores here. I hope that I didn't overlook any scores. Thanks to everyone who played… but what happened to Skylar and Milo? I guess that they were afraid to play against their dad! Also, my friend Christopher was over one day last week. He played too, but he felt his score was too low to submit (but it wasn't). Remember, this HSC is all for fun. I came in last place this round, but that doesn't matter to me. I still really enjoyed playing Escape. No one documented any bugs for bonus points. I did notice one bug: sometimes you can destroy an alien, and then a shot will come from where they were just a moment ago. This issue happened to me a few times. It was really cool to see Robot Killer, Escape and the arcade version of Berzerk all set up for play in Mark's game room. Thanks for taking the time to set all of that up, man. This round's overall winner is Mark. I had a good time playing (at separate times) Escape with Chris and Christopher. It's neat to have friends who also enjoy playing classic (and quite obscure) game systems. Escape is a pretty slow game, but once you play a few rounds of its somewhat pokey gameplay style, then you get used to it… and you'll even enjoy it! You have to play this game a few times in order to "get" its design, which is similar looking to Berzerk, but rather different once you get into the nitty-gritty of the game. I did notice that once Chris got past around the 10,000 point mark, the game did speed up quite a bit. The baddies got much deadlier: they seemed to move more often and they also fired faster. The main game for Round 4 of Arcadia 2001/MPT-03 High Score Club is Funky Fish, a scrolling game that takes place under water. 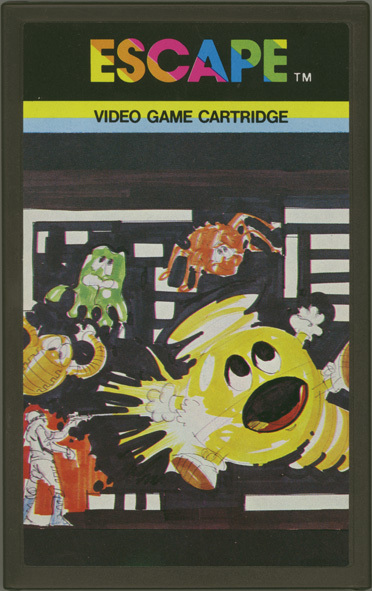 This game was announced for the Emerson Arcadia, but it wasn't ever released in the United States. It was released overseas. 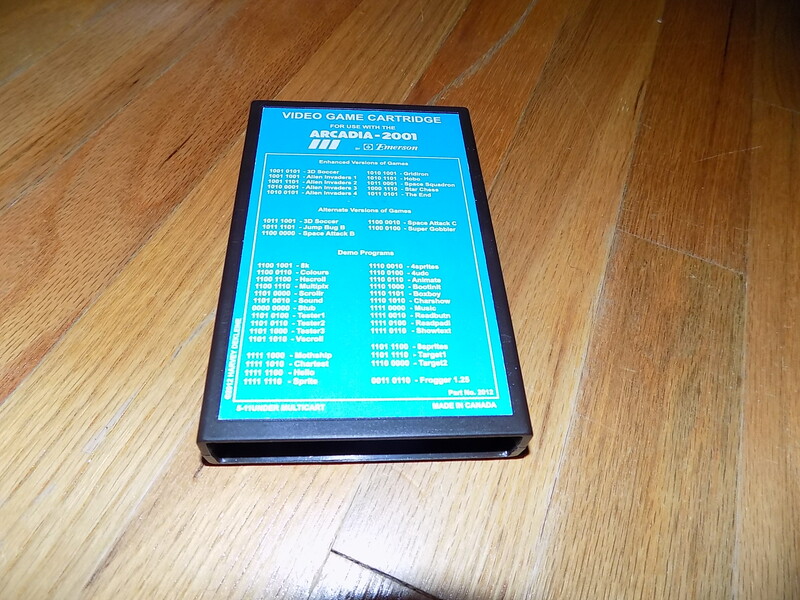 If you have a multicart, then you can play it on an Emerson system. If not, then you can play it under the Arcadia emulator. Like several other games in the Arcadia's game library, Funky Fish is based on an obscure arcade game. I need to play it a little tomorrow to see what the game options should be, but if you want to start "tackling" those underwater uglies, then "dive" right in! Matt, Jeff and Darrin.....no escape?? They must play some funky fish though! Maybe even my 3 1/2 y o daughter will get a score in on this 1!